Sony's XE93 manages to fit several features found on Sony's higher-end ZD9 into a much more mid-range offering with some results that from initial inspection look very promising indeed. 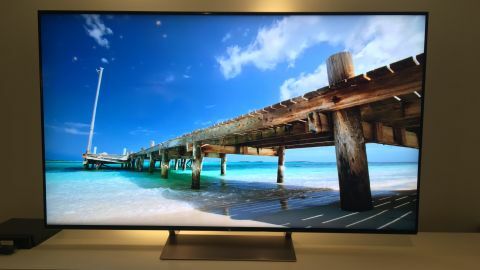 Sony's XE93 line is the third most premium of the manufacturer's 2017 lineup behind the ultra-premium Sony Bravia A1E OLED and the XE94. But rather than sitting as the awkward middle sibling between the higher-end offerings and the rest of the lineup, we came away from a recent Sony event most impressed with the XE93. Yes, it doesn't have the full-array backlight of the XE94 or the insane contrast of the A1E, but it has enough clever tech up its sleeve to deliver a seriously good picture performance, and we've got our fingers crossed that its mid-range positioning means that its eventual price doesn't leave our collective wallets in too much of a state. So first things first - the XE93 is available in 65-inch and 55-inch versions. We spent our time with the 65-inch model, but if you want to go any bigger then you'll have to opt for the XE94, which sits at a colossal 77-inches. The rear of the set is a slightly ugly cream color. Previous Bravia sets have opted for, what we think is, a much more stylish dark grey, but this model goes for a cream that's a similar hue to a color you mind find the walls of a rental property painted. But aside from its color (which lets be honest, you're unlikely to spend too much time looking at) Sony has been very clever with how its approached the back of the set. Cables sit behind removable plastic covers, and can be routed through the sets legs to ensure that they're almost invisible when viewed from the front of the set. The headline feature on the new panel is its Slim backlight drive+ technology. The set's predecessor, last year's XD93, featured a similar technology, but Sony has made some clever improvements in this year's model. Both last year's XD93 and this year's XE93 use edge-backlighting technology, meaning that the sets have rows of LEDs along the edges of their screen which can be turned off to make darker areas of the image go even darker. This isn't advanced as a full-array backlight which places LEDs behind the panel itself for much more accuracy - for that you'll have to opt for the more premium XE94. The difference between the XD93 and the XE93 is that this year's model places these rows of LEDs on the top and bottom of the screen rather than the left and right. This means that each LED is serving a much smaller (vertical) area, which has lead to a doubling of the number of backlight zones. This helps ensure that the images brightness is much more focussed. Rather than having light that bleeds over into darker areas of the image it can instead be focussed on a small glint of sunlight, creating a much more subtle, yet striking, image. Suffice to say the XE93 knows how to produce a solid HDR image, and will also support the three most common HDR standards around today: HDR10, Dolby Vision, and Hybrid Log Gamma. The second part of the story concerns the X1 extreme processor, which has made its way from last year's premium ZD9 set into the XE93. It's not quite as good an implementation as the ZD9, but the colors this set is capable of are really fantastic, and a massive improvement over the XD93 which the set was demo'd alongside. The set also does a fantastic job at upscaling SDR content to HDR, and suffers from none of the color-banding issues that such upscaling can create on other sets. All of this combines to create a fantastic level of image quality. Colors are rich and vibrant, and both highlights and darker portions of the image have a nice level of contrast to them. Away from the premium flagships, the Sony Bravia 65XE93 is looking like it might just be the TV to beat in the mid to high-end market. With its selective inclusion of many of Sony's high-end technologies, the set boasts a level of picture quality that we came away very impressed with, and a full suite of support for various HDR standards means that this isn't a set that's going to be outdated any time soon. The big question now is price. If this ends up being priced like a flagship then it might struggle to compete with the OLED competition, but if it manages to find a solid mid-range price-point then Sony could have a big hit on its hands.